Limited edition suspension commissioned by a Scottsdale collector and entrepreneur, this dramatic outdoor chandelier was created as a fluid and masculine interpretation of classical chandeliers. Considering light as a fluid vibration, it is built without any solid structure, thus revealing its secrets when reflected into a mirror or glossy painted floor. Looking like an elegant puzzle of entangled ropes (made out of woven hemp) that float and bounce back with the movement of the wind, the eyes always question its shape. Moreover, by adding crystals to the piece (as the core luminous elements), the warm texture of traditional candlelight and fire is transformed into a clean and vibrating constellation of lights. 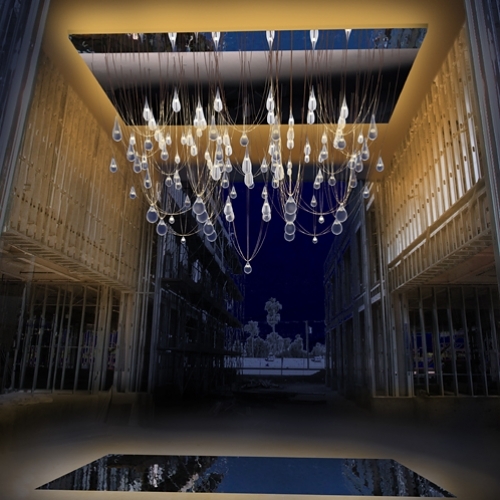 As a whole the airy chandelier looks as if it were falling from the ceiling, offering a dream of glimmering suspended crystals. As if in no-gravity.